On Saturday 22 October 2011 hundreds of people gathered in Market Square, Nottingham, to listen to speeches and offer support to the many disabled people being ‘hardest hit’ by Government policies of cuts to services and welfare. At the start of October, Youth Fight for Jobs (YFJ) and other activists started a 330 mile march from Jarrow to London. “Why? Because we’ve had enough, and we know that it doesn’t have to be this way.” It is 75 years since the first Jarrow March/Crusade of October 1936, when mass unemployment and extreme poverty in the north-east of England drove 200 men to march in protest from Jarrow to London. 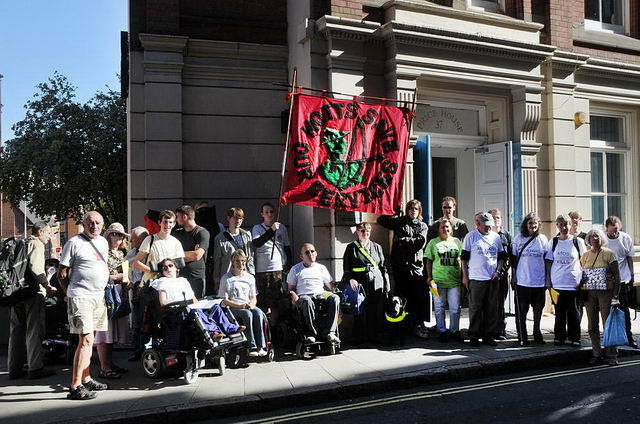 Notts Save Our Services will be welcoming the 2011 march on Saturday October 15th, on a day which is exactly 30 years since Norman Tebbit spoke his infamous words at a Tory party conference after the riots of 1981: “I grew up in the ’30s with an unemployed father. He didn’t riot. He got on his bike and looked for work, and he kept looking ’til he found it.” Seems like they haven’t learnt much as we have experienced both widespread riots AND major job cuts in 2011. Notts SOS is to welcome the marchers on the Forest Recreation Ground, and march with them to Market Square, where there will be a joint demonstration against the cuts. The route of the March has been agreed and marchers will approach the Forest from Nottingham Road (Basford) for a brief meeting up on the Forest Recreation Ground, then the march will go down Mansfield Road into the city centre ending up in the Market Square. This will be a major anti-cuts day for Nottingham and everyone is welcome to join the march and/or rally in the square against austerity, unemployment and education cuts. The march will also be welcomed in Mansfield the day before (see comment to this article for details). 10.00 Meet at Hucknall Ambulance Station on Annesley Road. Continue down Annesley Road to Hucknall Market Place. 10.30 Leave Market Place and continue down High Street. High Street becomes Portland Street and then Nottingham Road. 11.00 Straight on at roundabout onto Hucknall Lane. Hucknall Lane becomes Main Street. 11.30 Turn left onto Bulwell Market Place for 20 min rally and 10 min break. 12.00 Leave Market place on Highbury Road. Continue as Highbury Road becomes Vernon Road. 12.30 Take left fork onto Nottingham Road. Continue as Nottingham Road becomes Sherwood Rise. 13.00 Cross Gregory Boulevard onto Forest Recreation Ground. Notts SOS demonstration assembles here – around 30 mins. 13.30 Leave Forest, turning right onto Mansfield Road. Right onto Upper Parliament Street. Left onto King Street. Continue on to Old Market Square. 14.30 Rally on Old Market Square. Marchers will continue the march on Sunday 16th from Nottingham Trent Univ Clifton campus. 1.15 Nottingham Road becomes Leake Road.